What are the things that you need to look out for when looking forward to buying a pistol red dot? While there are many choices that you may encounter on the market today, finding the best pistol red dot can be something hard and difficult especially when every option claims to be the best among their competitors. If this is the case then you will surely end up overwhelmed and confused. We have made a comprehensive survey in the present market and acquainted ourselves with the different red dot offerings today. As a result, we made it possible to come up with only three, compressed them in this review to serve as your guide towards the best red dot that you can effectively make use of for your pistol. And to make your comparison much easier we have also come up with four essential criteria that will help you determine their similarities and differences. These criteria include: complexity, precision, durability and cost. Trijicon RMR 6.5 MOA Adjustable LED Red Dot Sight. This red dot from Trijicon comes with a range of features that spell out its complexity as a high quality firearm accessory. It is capable of being mounted to variable and fixed magnification optics. It is also the perfect reflexive sight to pair with your firearm or handgun and this can be done in many ways. Moreover, this red dot is also the ultimate lightweight reflex sight for your rifle. Vortex Razor Red Dot Sight, 3 MOA Dot RZR-2001. This red dot from Vortex renders top-tier performance and incredible versatility. It offers exceptional resolution and a wide field of view that will surely impress you. It works fast, accurate and highly dependable at all times. Vortex Venom Red Dot Top Load 3 MOA Dot. With this red dot from Vortex, you can make your AR, shotgun or pistol even more poisonous with its rapid target acquisition. It has a top load system that makes changing the CR 1632 battery a breeze, thereby alleviating the need to eliminate the sight when switching its power source. The controls for dot intensity and power are conveniently placed on the red dot’s left side portion. Trijicon RMR 6.5 MOA Adjustable LED Red Dot Sight. This red dot comes with an automatic brightness mode and controls for eight adjustable settings. Buttons of the unit are designed to be easily accessed and manipulated especially when you go hunting during the day or during the night. And with its multi-coated lens, it can create a wide-band light transmission for minimal change in target area color. Vortex Razor Red Dot Sight, 3 MOA Dot RZR-2001. With its top-tier performance build, this offering from Vortex offers you with exceptional resolution no matter what the condition or situation is. It is powered to display bright red dot that is easy to see. And with its reliable speed and accuracy, this red dot is something that will surely create a hunting experience that you have never ever tried before. Vortex Venom Red Dot Top Load 3 MOA Dot. 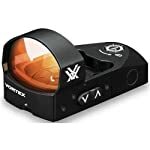 This red dot from Vortex promotes rapid target acquisition while providing you with precise point of aim thus, allowing you to get shots down range and on target fast. Its multi-coated screen renders clean, clear and wide-field view so you can aim at your target the precise and accurate way possible. Trijicon RMR 6.5 MOA Adjustable LED Red Dot Sight. The build of this red dot is based on its unique patented housing shape. It is actually made from forged 7075-T6 aircraft aluminum alloy housing shape that diverts the force of an impact away from the lens. This greatly increases the durability of the sight. Vortex Razor Red Dot Sight, 3 MOA Dot RZR-2001. This red dot lives by its strong build to ensure top-tier performance in many ways. While it performs fast, accurate and clear, this is also something that you can depend on as far as its compact nature and durability are concerned. Vortex Venom Red Dot Top Load 3 MOA Dot. Bearing the name Vortex, this red dot exudes a build that you can depend on for years. Made from high quality materials, this red dot will surely serve its purpose to providing you with exciting hunting experience for years to come. Trijicon RMR 6.5 MOA Adjustable LED Red Dot Sight. Red dots for pistols happen to be available at different prices. There are red dots that are too expensive while there are also those that come at bargain prices. Basically, many would agree that the price of the product also defines its overall quality. This means that the higher the price, the better the quality; and the lower the price, the more inferior its quality is. Compared to the other two choices on this list, this one from Trijicon happens to be the most expensive with its price that is more than six hundred bucks. With a price like this including the features it offers, do you think this is the best pistol red dot for you? Vortex Razor Red Dot Sight, 3 MOA Dot RZR-2001. Packed with many cool and useful features and functionalities, this red dot from Vortex happens to be a superior choice. After all it bears the name of one of the most respected manufacturers of high quality and affordable firearm accessories in the world. Vortex Razor Red Dot Sight is fairly tagged with a price of less than four hundred bucks, making it as an excellent choice if you wish to come up with something that is of high quality and dependability in many ways. Vortex Venom Red Dot Top Load 3 MOA Dot. 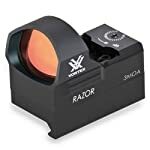 Compared to the first two options that we have on this list, the Vortex Venom Red Dot places itself as the lowest in terms of price. With its myriad of features and functionalities, this proves to be an effective pick especially when you are looking for a high quality and durable red dot that you wish to own for years. Priced at less than two hundred ten bucks, this red dot from Vortex makes a money-saving option for you so as to meet your red dot needs. Finding the best pistol red dot may seem to be hard these days with all those competing that you can find around. But with this review, finding the best one happens to be much easier since we have gathered the best players on the market nowadays. And based from our comparisons, we have come to the point of realization that Vortex Venom Red Dot Top Load 3 MOA Dot simply made it to the top, leading the way as the best performer in this game. But the two other options are a great choice too, if you say so. After all, they also played admirably well, too.